We did it! We finished! 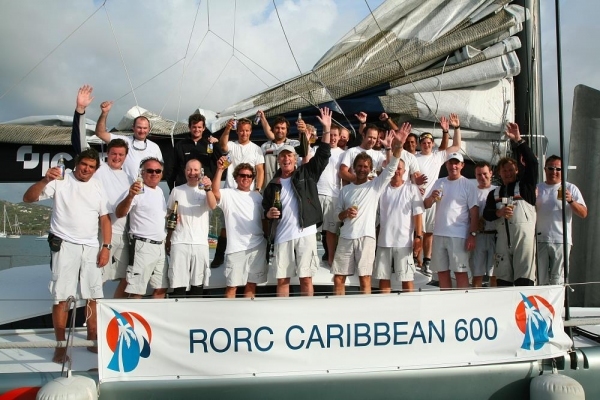 Star Chaser and her elated crew crossed the finish line at 05h35m50s to finish her first RORC Caribbean 600! Beers and cheers were had all around as we arrived at the dock, where the racing committee was welcoming us with some much awaited and anticipated beers. Good thing he has been married for almost 29 years and his wife knows him well! It was exhilarating sailing those last legs, beam reaching to Redonda - the lonely kingdom, seeing whales and dolphins and then rounding the corner to beat back to Antigua and the beers. It could not have been a more beautiful night to this beat, with a star lit night, fairly calm seas and a good wind, making for some great memories. What can we say; where yesterday we were rounding islands like there was no tomorrow, today we haven't rounded any yet! First reason being that the leg we're on (St Barths to Guadeloupe) is the longest one in the race! But also because, with the rounding point of the islands almost in view, we've sailed ourselves into a bit of a wind hole on the SW corner of Guadeloupe, despite our best efforts to avoid it. 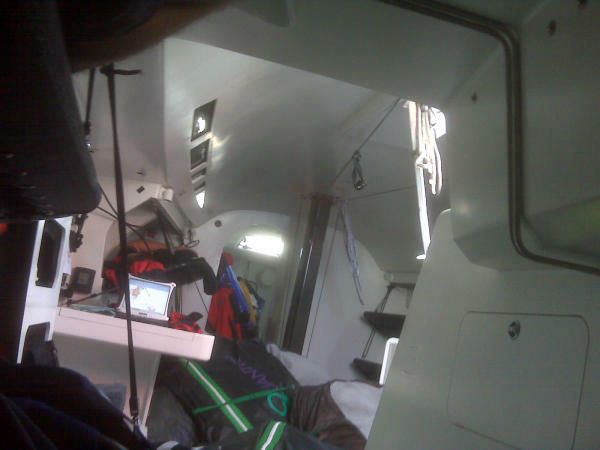 Spirits are still high though and both watches are on deck, hiking out on the low side to get the boat moving again. And as I write this, we have more than tripled our speed! Not quite as exciting as it sounds though as going from less then 1 to 3 knots, still doesn't see us moving very fast. But at least we're moving again! Few more miles before we round Les Saintes and start our beat to La Desirade and then it's only 3 more legs until the Beer waypoint! You gotta love offshore racing in the Caribbean! Mike Slade's 100ft Maxi, ICAP Leopard crossed the finish line under Shirley Heights, Antigua at 07:25:14 Local time (GMT-4) to set the monohull elapsed time for future yachts to beat. "We have set a time for this fantastic race, so come and join us next year to try and beat it." 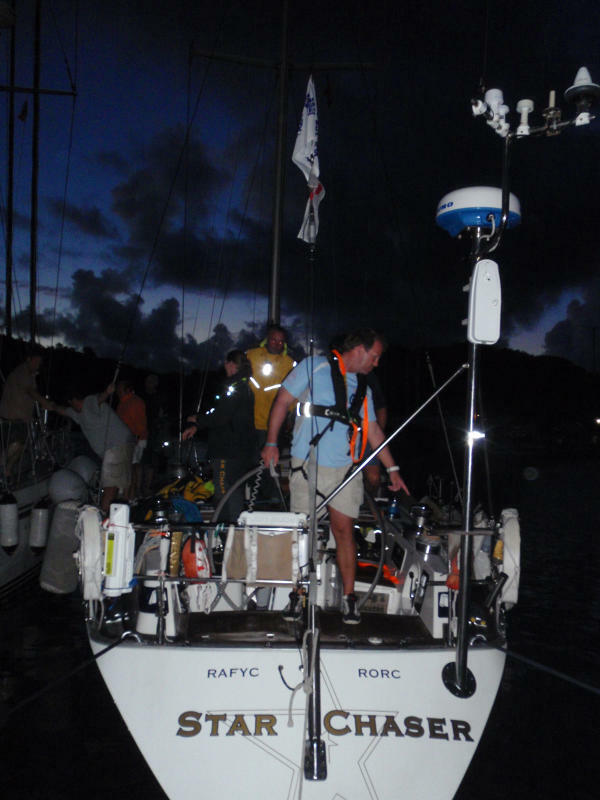 said a chirpy but tired Mike Slade as ICAP Leopard moored up at the Antigua Yacht Club. 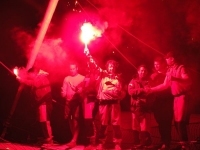 "Make no mistake; this is a tough race, especially for the smaller boats still out there. It has taken us nearly two days and that is just about enough, hats off to the smaller boats who may not be in for some time, I am sure the crews will all be very tired but will be looking forward to a warm Antiguan welcome." Physically exhausted, wringing wet and full of pride, John Burnie's 60ft ORMA Trimaran, Region Guadeloupe crossed the finish line under Shirley Heights, Antigua at 03:51:05 Local time (GMT-4) to set the multi-hull elapsed time for future multihulls to beat. Dockside at the Antigua Yacht Club, John Burnie said: "That was an incredible ride, all credit to the crew but hats off to the yacht owner Claude Thelier who has completed an Atlantic crossing in this boat, in nine days on his own. We wanted to set a standard for others to beat, we pushed the boat really hard and we never backed off." Besides John there were eight other crew; Claude Thelier, Iain Bradshaw, Mark Stevens, Ben Craig-Cameron, Ben Wood, Ed Danby, Stephane Squarcioni and Steve Branagh. 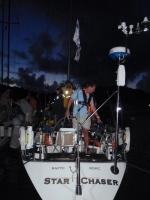 We rounded Nevis in the dark and had a good run behind the back of St Kitts and St Eustatius and used the little lull behind Saba to do a headsail change, before rounding this beautiful rain forested volcano island, only to start beating east, direction St Barths. It certainly is also a race that takes you around sides of the islands not much visited, giving our crew some astonishing views of the islands. It certainly is giving some people some ideas of where they would like to come back to! As our skipper Boogie (Wijnand van den Boogaard just said: "It's hard to continue racing when you pass all these amazing bays and beaches! 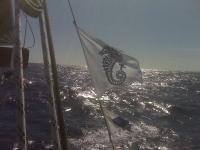 Offshore racing Caribbean style!" Luckily enough there will be some partying Caribbean style when we arrive to keep us going! We've just rounded the south part of St Maarten and are short tacking our way up the Anguilla Channel to Tintamarre, before heading South East again towards St Barths and then it's the long haul all the way south to Guadeloupe. Latest news we've had from friends and family following us around the course is that we were lying 1st in class and 8th overall. Not bad for our motley crew! We will work hard to keep this going! Back on watch in a few minutes..."
"This says it all - fetching to Guadalupe in 18 kts. All well - this can't be osshore if its so nice?!" Any ideas that this race was a holiday jaunt out of Antigua have now been binned! A cracking start into heavy seas soon dispelled any thoughts of an easy trip. A great fetch to Barbuda with boat speed around 20 knots soon had us well in the lead. But the angle and strength of breeze played into the hands of the Trimaran, who we closely followed around the top mark and stayed in sight all the way down to Nevis VMG running. As expected the trimaran soon disappeared over the horizon leaving us to enjoy a fabulous evening sail along the southern coast of Nevis and St Kitts. Flat water and 20 knots plus boat speed was as good as it ever gets and the reason why we were keen to support this RORC initiative around what is undoubtedly one of the best yacht race tracks in the world. A busy night weaving through the islands of St Barths and St Maartin with the crew getting no rest as we went through many sail changes. We are now half way through the long leg down to Guadeloupe passing close to Montserrat at this moment. Sadly no chance of a kite as we remain firmly on the wind all the way to Il De Saints - Bugger. Current boat speed 16 knots in 20 knots of breeze at a TWA of 60 degrees, it is a hard bumpy ride and unlikely to change much until we round the bottom of Guadeloupe in 60 odd miles. Hoping to finish on Wednesday morning and setting the inaugural monohull race record of under 48 HRS. This time my porridge has tropical fruit in it, not surprising as it was bought in Antigua but much prefer a rum punch. Adrian Lee writes: "After one night.."